Using the power of the wind for aerating a pond or pumping water. Whenever I go to visit a pond in need of help I am always asked of the effectiveness of windmill aeration systems to supply the circulation and oxygenation needed to restore a pond that is full of stinky muck and sludge or feeling the common problems of thick algae growth on the surface. Of course an electric aeration system might be more efficient in the end there is still the idea that a windmill could assist in beneficial ways and as such would require no costs beyond the initial installation and proper anchoring of the windmill. The idea is sound and understandable with the cost of operating an aerator but sometimes a windmill is not all it is cracked up to be despite the best marketing points of dealers and the manufacturers of these devices. Before we continue I'd like to mention a few things. These windmills DO NOT create electricity and cannot be tinkered with or jimmy-rigged to create AC current. These pump air into ponds or pump water using air. So if you want to generate electricity and go off-grid then you need a windmill to generate electricity . One more thing to keep in mind is that you can probably aerate a pond cheaper with a small efficient electric system. The ideal of not paying for kilowats of power to aerate is completly valid but windmills will cost you at least $1500 and that doesn't include footings, time to build it, etc. Expect $2000 to $6000 in costs. First, before we get to The Pond Report windmill ratings of the different options available on the market, let me try and describe the operation of the typical windmill system and how the homemade aeration aficionado may have a lot to realize before embarking on a new project such as trying to build a do-it-yourself windmill aeration system. Most windmills built and sold in North America are constructed in a similar fashion and before I give my ratings for the different approaches for anchoring and construction I will start with the basic step by step approach. The tower of the windmill must be strong enough to withstand severe winds and pond owners often underestimate the ability of their clay or soil to properly anchor the steel anchoring pins included with most kits. For the last 20 odd years the principle style of windmill tower has been a three-legged twenty foot structure made of galvanized metal. The average footprint of a 20 foot windmill is between 84 and 100 inches depending on the precise model being purchased. There are similarities between the models so ensure than the retailer offers the precise distance for the anchoring pins especially if you want to anchor them into cement footing prior to erecting the windmill tower. I have seen some poor souls anchor their pins in 12 inch diameter sonotubes only to discover that their footings were off center by 2 inches and the results were not pretty! The three-legged windmill tower has been popularized by the Koenders and Superior brand of windmills. There are also four legged windmills such as the Beckermills Windmills or the Windmills which requires a square based footprint of various sizes depending on which height is chosen. . I find that it is best to but the tallest windmill that will fit your budget and your landscape; the higher tower allows the windmill head, fan blades, to capture as much wind as possible. While manufacturers claim that their mills will operate in as little as 5 mph I tend to err on the side of caution and suggest that it is best to buy the tallest windmill that will fit and expect that the wind required is as much as double to what is reported! A new arrival on the scene is the uni-pole or single pole mount windmill. Until now I've seen many people mount the head of a windmill on a number of structures from old radio towers to telephone poles with limiting degrees of success. The single pole can be aesthetically more appealing to many pond owners who find that next to their pond the three or four legged structure appears either too old-fashioned or too much like a power company or cellphone broadcast tower! 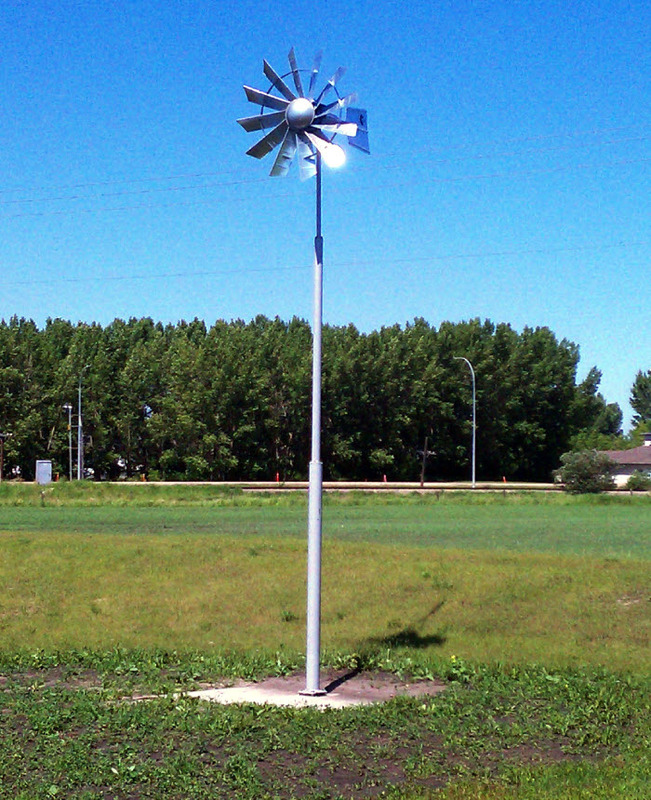 The new 25 foot tall single uni-pole windmill has the advantage of being able to enter into zones of higher wind speeds which is critical especially when dual-diaphragm compressors are used to aerate larger ponds with a windmill. One nice thing about a unipole windmill is that the footprint of the structure is much smaller than a three or four legged windmill although it does require a solid slab of approximately 10 by 10 feet to be secure. The aluminum reinforced pole is similar to a lighting mast and usually comes with a hinged base or pivot points like the multi-legged models to make erection and servicing off the windmill easier. The taller structure definitely puts the fan blades up where the swifter winds blow; I've seen a unit mounted on a 40 foot tower and that sucker really never stopped spinning there was so much constant wind. Of course mounting the compressor on build your own windmill type towers makes servicing or changing parts difficult so may be only an option for farmers or owners of machinery or tractors or cranes to to help with the installation. Most windmills sold in North America, besides the ones that generate electricity, are diaphragm pumps. American Eagle uses a bellows style air pump which has a high volume but lower pressure capabilities making it more suited for aerating ponds less than 15 feet deep. Do you want to generate electricity with a windmill? Anyone familiar with the simplicity of an old-fashioned diaphragm pump understands that this is likely the main reason for the absolute success in efficiency of a windmill aeration system. These compressors can deliver anywhere from 6 to 30 PSI depending on the make and model chosen which make them serious competition to such renewable energy opponents as the solar power systems which typically generate less than 5 PSI for a similarly priced system. An expensive windmill will still be much cheaper than an inexpensive solar system so I often recommend to my clients to consider wind power over solar power. There are a few configurations available on the market today and anyone visiting a pond supply store should understand the needs of their pond versus the realistic performance parameters of the windmill; be sure the company you buy from offers the expertise and preferably the local windmill installation service as the building of a windmill plus the installation of airstones can consume several days for a novice and due to the complexity of the systems, despite the detailed instructions that typically come with the product, the final cost in time alone can make it a better deal to hire the experts to build and install the system. When my team does a complete building a windmill and installing a windmill package we usually charge $1500 so even though you are buying a windmill on Ebay you must realize that there will be additional costs! Let me get back to the diaphragm: typically a sheer rubber circular piece of heavy duty flexible composite material creates a seal on the pump head and as the blades or fans of the windmill turn it pulls and pushes the diaphragm and the sealed chamber builds up pressure and pumps it down an airline towards the diffuser, airstone or diffuser tubing in the pond. Because the high pressure capacity of the windmill you can run a tubing length of up to several hundred feet and your diffuser can be placed in a depth of over 20 feet. The windmill diaphragm is the one thing we see wear out after a few years of service but there are windmill repair kits available for all models sold and the replacement of these parts is as easy as opening the hatch in the windmill head and removing the worn parts and replacing them with the crisp black diaphragms. To perform this windmill maintenance it requires the tower is lowered to be able to open and adjust the windmill head and this is another reason why hinged anchor braces or pivot pairs should be used. There are so many options when it comes to windmill airiation that it is crucial to use due diligence and to look for the best deal. But beware, the best deal isn't always the cheapest. I have seen some people save a few hundred dollars by buying a windmill on eBay but then they got no service or tech support when things go wrong. My advice has always been: deal with a company that does more than sell pond supplies; make sure they have an actual store, with employees and a track record of knowing what they are doing. There is more to doing the right thing than saving a few dollars; getting good advice and information is worth much more in the long run. If you really really want a windmill you should first try to find a local dealer. If you have to drive hours hours to go meet a seller and kick the tires it is worth it. Windmills can need maintenance and servicing, so you should first see if their is a local company willing to stand by what they sell. One thing about windmills is that in the heat of summer when we often see windless hot days, which are perfect for creating algae and also perfect for rendering a windmill aerator useless, the windmill becomes nothing more than a huge lawn ornament. A hybrid system can be used to turn on a small electric system when winds drop or sometimes going completely electric can be a better investment as you can turn it on and off only when you need it. Of course windmill companies will try and sell a windmill but sometimes an electric system is more efficient and will better suit the pond. I've seen my share of people with windmills that barely turn because the overestimated the amount of wind they received. In most cases a windmill will be fine to aerate small ponds, maybe not ideal for commercial or industrial applications but for hobby ponds or just to help circulate and aerate a windmill can be perfect. If you have a windy spot without trees in the area the windmill will be a great system...when the wind blows the bubbles will be flowing and the pond keeps aerated! There are many online windmill sellers, all windmills are pretty easy to order online and you will get get ten boxes on your porch... but having a local rep available at the end of the phone is helpful and what I recommend most if possible. If not then you want to buy from a company that provides support after the purchase. I also tell my clients that building and anchoring the windmill isn't like setting up a bird feeder...you need cement footings and the patience of Job to put all the braces, bolts, fasteners and screws into place! All reviews are based on our knowledge and should be considered as opinions and not scientific or necessarily valid in some cases due to changes in manufacturing quality. May the buyer beware in all cases and ask questions before you buy. Windmill manufacturers are welcome to submit their product information so we may post it to better inform consumers. Some manufacturers claim"WE HAVE THE BEST WINDMILL IN THE WORLD" so how could you not say we are the best windmill ever produced. An intelligent person tends to see such claims for what they really are. The American Eagle bellows windmill is a high-volume low-pressure aeration windmill. The bellows type of compressor delivers from 3 to 6 CFM with a maximum 8 PSI which means your diffuser airstones should not be in waters deeper than 15 feet. The Manufacturer recommends 12 foot placement of diffusers. The American Eagle is another impressive four legged tower that comes in 18 foot and 23 foot towers and has a large 6 foot diameter fan head. They use a bellows type air compressor of Goodyear quality and the warranty on the bellows, the most important part, is 5 years which is the longest warranty of any manufacturer. The American Eagle Windmills now have Zinc Plate/Yellow Chromate Crankshafts. The original crankshafts have been field tested for over 3 years now; therefore much longer warranties will come into effect soon. They field test hundreds of units prior to giving unrealistic warranties. We will keep you posted of any new American Eagle developments. The American Eagle is a fine brand but we've been asked to not print anything about them as they consider saying anything less than "The American Eagle Windmill is the Best Windmill in the World" to be an insult and a falsehood. They asked us not to compare their windmills to other popular brands because they insist that their brand is a higher grade and commercial quality and should not be mentioned in the same category as other windmills. They don't want to be reviewed so you need to talk with them directly to determine if their sales pitch is convincing.
" An American Eagle Windmill will aerate ponds up to 2 acres. The 13, 18, 23, 28 & 33 foot American Eagle are identical except for the Tower Height. The 28 foot has a larger 6 feet 6 inch Wheel. If you can erect the windmill in a wide open windy area at least 200 feet from any buildings, trees or other wind obstructions the 13 or 18 foot windmill is all you need. If you have wind obstructions closer you will want to purchase the 23, 28 or 33 foot American Eagle. It has been estimated by an independent study that the American Eagle can produce up to 6 CFM in strong winds 20 to 25 mph, about 4 CFM at 15 to 20 mph and 3 + CFM in Light to Moderate Breezes. The American Eagle is a High Volume Bellow type compressor taking a 1 & 3/4"Stroke unlike High Pressure Diaphragm types that only make a 1/2" stroke thus The American Eagle can produce over 3 times the volume of most competitors. Over 14,600 Windmills sold and NOT one unsatisfied customer." High Air Output and pressure capability with flows from 3.0 - 4.5 CFM rating depending on wind speed. Compressor rated at 30 psi meaning you can aerate a pond up to 50 feet deep! If you have one that deep let me know because you must use a submarine to see the bottom! Outdoor Water Solutions is also the only company to offer a full 5 year warranty on their compressors bearing's and cam's! Easy Assembly - Windmill designed for easy assembly with offset holes for quick alignment and rounded corners for improved safety when working with steel. Angle Cut Fan Blades - Engineered to capture and operate even with a limited amount of wind speed. Longer than many competitors on the market to catch more wind. Total head width is 73", which is the largest head on the market. More surface area means more torque and this means more air is pumped into your pond. One Piece Hub Assembly - Reduces the amount of parts to improve assembly time and improve on long term maintenance of the windmill. The one piece hub uses two locking collars and a through bolt at the end of the compressor shaft. You can install the head on the shaft in 5 minutes and it will stay put. Other companies use squeeze clamps that take over an hour to install and can loosen over time. Anyone who has assembled a Koenders Windmill will know what a frustrating thing this is! The Outdoor Water Solutions one piece hub assembly really takes the hassle out of the building! Outdoor Water Solutions has introduced what we feel are some really exciting new products! They have the enhanced their pond care product offering and now offer: · 24' Traditional Windmill Towers · 4 Legged Windmill Towers · 25' Telescopic Windmill Towers · Wooden Windmills (both for aeration and ornamental) · A full line of Powder Coated windmills with Customized Tailfins. They also have a revolutionary new product called an "Aerator Control Box" that allows you to connect a windmill to an Electric aerator and aerate 24 hours a day. When the wind blows, your pond is aerated by the windmill. When the wind stops, it turns on your electric aerator. Both run through the same set of airlines and diffusers, saving you money on both electricity and in getting aeration to your pond or lake. OWS has developed their windmill aeration systems with 'Bal-Cam' technology, the most advanced system available today. "BalCam" technology significantly increases the amount of air produced with a single diaphragm compressor utilizing a balanced camshaft system. Wind-driven aeration works with nature to improve pond ecosystems, without the need for electricity or fuels. Wind power is good for the environment, and also allows for installation of the system even where electricity is not readily available. OWS systems are reliable, long lasting, effective and attractive in suburban backyards, rural landscape settings, golf courses and municipal ponds and lakes. Koenders Windmills Made in Canada. The diaphragm system of the Koenders compressors can deliver up to 30PSI which is great for deep water performance and is many times higher than the American Eagle. CFM ranges from 1.5 to 3CFM depending on if you have a single or dual diaphragm model. Koenders windmills have been in the windmill business for years and have undergone many changes in the last few years. Their website now claims they were voted the number one windmill in 2012 and there is a link to a website they created that says indeed they are number one. It makes us roll our eyes when these companies hire companies to create multiple blogs and websites to rave about how goof their products are! Heck, these guys even made a website called PondReports.com many years after The Pond Report website was started and they tried to use our good name to boost their own products! But we're talking about windmills and specifically Koenders so let's not focus on a website company called Relemtless Technology that creatse a bunch of spammy pages that appear as independant blogs and websites to boost Koenders reputation. Who know...but it's good to check things out! First, their products: They have three tower heights to choose fro: 12, 16 and 20 and new 24 foot tall tower towers (all with three legs) and they have a sleek and modern windmill the 25 foot high Uni-Pole Windmill Aeration System. Their Single Diaphragm Pump Compressor produces up to 1.5 CFM and the double pump compressor produces up to 3 CFM. Their comprehensive warranty is a solid three years on the their windmills. Their continuing efforts to improve quality have paid off, especially for consumers who want a quality aerating windmill, and in the newer Windmill Installation Manuals they reference to the offset hole technology they use which adds to the overall strength of the structure. Having to use tapered alignment punches and needle nose vice grips slows down the assembly but it adds to the strength enormously; some competitors use slotted holes to overcome this perceived ‘problem’ but when a nut comes loose then the strength is lost completely. The strength of any windmill is one of the keys to safety and longevity and Koenders Windmills have, through their years of product development, produced some of the best innovations in windmill technology that competitors often try to imitate. Fairly easy to build, a DVD is included in their kits, but watch the barbs on the metal when building the unit; gloves are recommended and handy gloves are sold by Koenders. They claim that the single pump head is suitable for up to 2 acre ponds and the deeper the aisrtone the more acreage you can airiate with a windmill. Koenders windmills have been icons of top quality so people wanting to buy a quality Made in Canada windmill should look no further. The quality in Koenders has been proven again and again by thousands of satisfied customers. Head offices in Regina, Canada means decent service anywhere in North America as they ship their mills from their central location very quickly. Superior Windmills Made in Canada. Another three legged system available in 4 sizes, 12',16, 20 and 24'; with Jetstream and Turbo Jetstream options. Superior windmills is based in Saskatchewan Canada, and is a serious competitor to Koenders Windmills. We have heard many customers who bought the Superior models complain about the lack of customer service and the poor quality of the merchandise. Of course time moves forward and we would hope that now after over a decade in business that their systems would have improved in quality. Their website was set-up by the same company that created the Koenders website and the whole range of websites and blogs that were created to give the impression that independent websites were giving glowing recomendations of their products.If you are like us you can see through such veiled attempts at trickery. It's actually been over 5 years that we've had a customer report on Superior so if anyone knows how the quality is p[progressing, if it is getting better or worse, please let us know. The company sent out press releases about how they are doing better but their website and blog seem to be stuck in 2009 so it's hard to tell. They still advertise their systems on the Internet but we can't give a hard and fast rating or review of their systems based on the timeline. Quality issues dogged the company in its early days but since manufacture reverted back to Saskatchewan, the quality has improved dramatically and they now offer excellent value for money Several years ago Superior Windmills designed a dual diaphragm compressor and now apparently hold a patent on this technology. So successful is this design, that the market leader Koenders Windmills uses this product under license in all its dual diaphragm models. Many of the design strengths of Koenders are featured in the Superior range, which is not surprising as they both shared many of the same manufacturing specifications and processes a few years ago. As I said, we don't have much current information on Superior Windmills. Like it or not they seem to still have a connection to Koenders windmill and we're not sure if this is for better or for worse given both firms history and issues over the years. Beckermills Windmills Made in USA. The Beckermills system is a sturdy four legged tower and boasts the largest diaphragm and large fan blades precision engineered to operate at lower wind speeds and allowing the single unit to deliver over 3.2 CFM. The highest air output of any single diaphragm model. Available in 12, 16 and 20 foot models and also an impressive array of colors these mills have never ceased to impress the owners who buy them. Large 72" Diameter fan wheel. Twelve blades are fully tapered and get wider at the outer tips, and also change pitch. This allows blade assembly to start turning at low wind speeds and also develop high power in strong winds. Welded steel hub is completely assembled. The blades can easily be attached to the hub. Hub securely attaches to shaft with 2 set screws tightened down to flat spots on the shaft, and a bolt and washer in the end of the shaft prevents the fan wheel from ever coming off. Direct drive diaphragm pump with 1/2" stroke. The compressor is made up of a precision machined diaphragm push plate, 2 valve retainers, and a cast iron bearing holder on cam shaft. (No welds to break or warping of steel due to welding.) The diaphragm is reinforced neoprene die cut for accuracy and longevity. The piston and diaphragm assembly is 60% larger than others, and with the added power of a 72" blade assembly, will pump 60% more air into your water. Intake Air: All intake air is filtered through a re-cleanable filter. Crankshaft and Bearings: The crankshaft is made of high strength 1045 TGP Steel. Bearings are permanently grease sealed, and are designed for heavy load capacity. 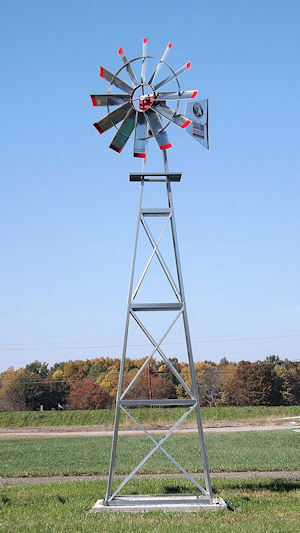 Very good quality windmill, made in the USA, with a three year warranty. Head office in Wapakoneta, Ohio and no office found in Canada means most owners of these mills are in the USA. The Lake and Pond Management Guidebook is the successor to the best-selling Lake Smarts: The First Lake Maintenance Handbook, the "bible" for small-scale lake and pond improvements, published by the Terrene Institute in 1993. Completely revised and updated, now published by Lewis Publishers, this guidebook contains over 300 ideas and projects including step-by-step practical, low-cost solutions to a wide range of problems that lake management professionals face everyday. Coverage includes shoreline buffer installation, fisheries management, reducing nuisance algal growth, controlling exotic aquatic plants, lakeside wastewater treatment systems, small scale dredging, and more. Poly Non-Weighted Airline - 1/2"